By far the nicest, cleanest beach in the area. If you are driving, the easiest way to find the beach is to go south on second until you see the McDonalds (that's Highway 1). Turn right and in about 5 miles you will see a sign that tells you to turn right for Estero Beach and another to take a left about a mile down the road. -- If you are on foot, you can catch one of the red and white micro-buses on Juarez Street that says "Chapultepec" ($4.50 MXP). When you see the bus turn right on the highway at the sign for the beach, get ready, when you see the sign to go left you will need to get off the bus and walk (about 25 minutes) the rest of the way. La Bufadora is one of three natural blow holes in the world, and one of Mexico's most visited natural wonders. The pressure of the surf forces water in an under ground cavern up through a hole like a geyser. There are tours in micro-buses that leave from the corner of Blvd. Lazero Cardenas & Macheros (next to the horse & buggy tours). They charge $16.00 USD per person to take you there (about 45 min. drive) and back. Take a tour of downtown Ensenada in a horse drawn carriage. A 30 minute buggy ride costs around $5.00 USD per person (kids under 12 years old $2.50 USD). Look for them at Lazero Cardenas & Macheros. Sport fishing is big business here. There are a lot of places near the dock to hire a boat and though prices may be negotiable . . . we will give you one example so that you will have an idea of what the going rate is. Boats Juanito has 40' day boats (up to 8 people) available for $750 USD. Expect prices to vary according to the size of the boat, the amount of time you will be out on the water, what you are fishing for (where they need to go), and how many people you have in your fishing party. 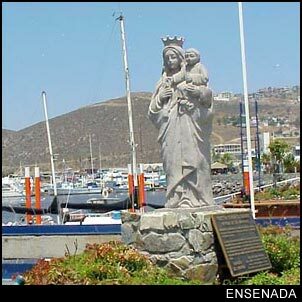 Ensenada is also the home of the Baja 500 & 1000 races. They are held around the beginning of June each year, but their is no fixed date so you will have to check before you make plans.